di Women in Business 29 Novembre 2018 8 min. Not long ago, I came across an article about a famous brand joining forces with the women of the Samburu tribe in Northern Kenya. This collaboration came in the form of a small elephant shaped bag decorated with intricate beading artwork by the Samburu women. The proceeds would go towards supporting the work of the Elephant Crisis Fund to stop the illegal ivory poaching. I thought it was very fascinating that these tribal women were offering their skills to protect the animals with which they shared the same land, and so I started looking up the Samburu tribe, women in Africa in general and their working life situation. The results were not as fascinating as the beading work on these small leather elephants. Most of the articles and research online were focusing on how today, in 2018, women were still the ‘silent victims’ of tribal and cultural norms. Whether they are working in the mining fields or in the business sector, women in Africa are facing a lot of discrimination and injustice. One of the most cited problems is one that is common in almost all economies: the infamous gender wage gap. Not only are the women paid much less than men for the same task, but there is also a large impact in the economy of the African countries, especially the ones in the west coast. Countries such as Niger, Burkina Faso, Ivory Coast and Mali lose 10 to 23% of their GDP due to wage inequalities, states a report by the IMF. Almost one fourth of the total GDP is left on the table in countries where a dollar can make a difference in people’s everyday life. Adding to that, research shows that shrinking the pay gap between the two genders can lead to almost 30% more agricultural produce in women’s farms, which in turn could provide an additional revenue to the economy. Another issue that raises flags is the husband dependence of many women in rural communities. On this day, women in a range of roles from farming, to mining and trading facilities, depend on their husbands and sons to access land, fuel, livestock, fodder, or even a job. According to the WEF, women are responsible for 70% of the food generated in the continent and occupy almost half of the small-size farming jobs. But these numbers oppose the ones of female farm and land owners, which come to just about 20%. Cultural norms and traditions promote the male members of the family as owners of the land and the property rights associated with it; hence, in order for females to access what clearly belongs to them, they need their husbands’ or sons’ permission. Meanwhile, a similar situation takes place in the mining industry where females work mostly as artisanal miners. An artisanal miner is not formally employed by a specific company but uses his or her own resources -mostly hand tools- for metal and mineral mining. A research conducted by Carleton University shows that even though female mine workers account for 50% of the mining workforce, their work remains under the radar and often goes unacknowledged due to the independent status of artisanal mining. The results of the unrecognized work are harmful to the economic independence of women. Most of the times the female workers’ wages are linked to those of their husbands’. In this sense, the men are paid for both theirs and their wives’ work and can even have total control over their wives’ earnings. Local norms, as well as cultural and tribal restrictions are a great hindrance to women’s rights and actions. These norms very often limit the participation of women in business ventures, while at the same time do not allow involvement in the local communities and authorities. With gender biases present in both business and economic laws, African women are left unsupported in their entrepreneurial efforts while at the same time lack access in social networks, financial assets and mentorship. These inequalities are negatively affecting the numbers of African women that are active in formal roles in the public and private sectors and are to blame for the large percentage of females in the informal economy. Although some measures are taken to minimize the inequalities, the frameworks either remain unused or tackle front-end issues that have limited effects in the society. The economic empowerment of women and girls in Africa can lead to significant advantages, positive externalities and financial gains for communities at local and country level. As a response to the current situation, there are many efforts taking place in order to help African women become economically independent, educated and active in shaping current events. 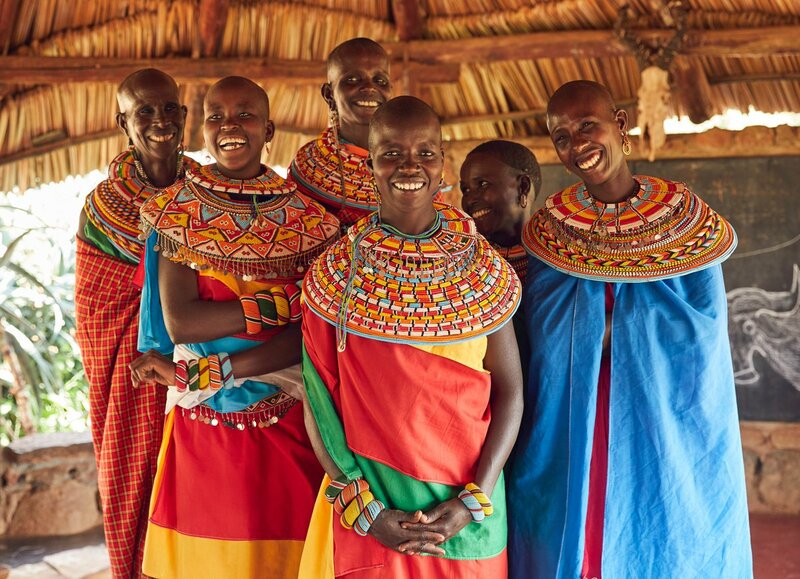 A great example as mentioned in the beginning is the Samburu Woman Trust in Northern Kenya. Founded in 2009, the SWT promotes women and girls’ rights in health, work, resources, and justice through real involvement in decision-making and policy influencing. Another impactful effort is made by the Laikipia Permaculture Centre, that is aiding women of four indigenous groups build ecological enterprises. This effort aims at strengthening the women’s presence in local communities but also in establishing food security for their families. The importance of women in leadership positions, and the exponential positive effects these women have when acting as mentors are issues clearly stated and supported by the IMF. One success case is the election of the first female leader in Africa, Ellen Sirleaf Johnson, president of Liberia. This historic event was a turning point for women representatives in the Liberian government but also across the continent. Worth mentioning is also the story of a Ugandan artisanal miner that started out by buying ore and renting out tools and ended up becoming the owner of multiple mineshafts. She not only provided a decent life and studies to her own children, but also expanded her investments in the mining and farming businesses, contributing greatly to the local community. Providing educational opportunities to women and actively involving them in business and in decision-making processes should become a priority across all African nations. The equal economic inclusion of both genders in the communities will minimize the wage gap, diminish the inconsistencies that exist in legal frameworks and promote the self-reliance of females in Africa. Only then, will real development and progress arise for society as a whole. Women in Business is the first female association at the Bocconi University and in Italy; the objective is to actively contribute to a greater awareness of the topic of women empowerment through the creation of a female network which would be able to link Bocconi’s female students today with the University’s alumnae and working professionals.